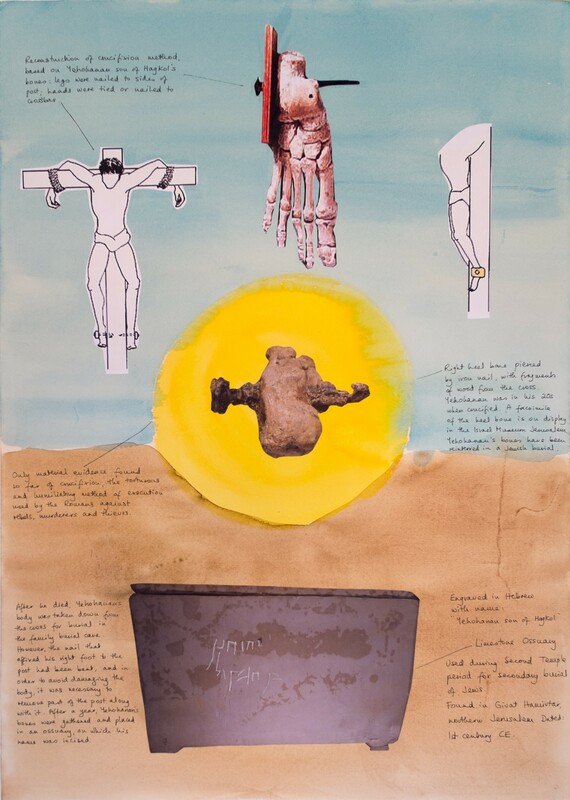 This collage mixed media piece brings together the various known elements relating to the crucifixion and burial of Yehohanan Ben Hagkol. 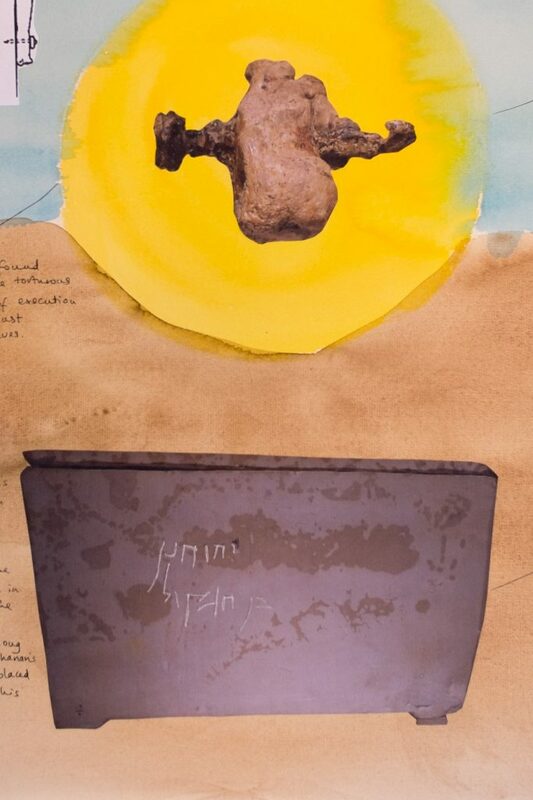 In a Jewish burial cave in Givat Hamivtar, Northern Jerusalem, dating from the late Second Temple period (1st Century CE), was found a fascinating limestone ossuary bearing the rough inscription in Hebrew of the name Yehohanan Ben Hagkol. In that period, Jewish burial was typically carried out by laying the deceased on a shelf in the family burial cave, and returning a year later to collect the bones (all that would remain) and place them in a limestone ossuary. Inside this particular bone box were resting the remains of a young man in his 20s, together with the bones of a child. This is not remarkable. Occasionally in ancient times, the remains of a second person from the same family would be added to an ossuary. Yehohanan’s ossuary contents are so important because a long iron nail was found piercing the right heel bone of the deceased. This is the only material evidence ever found anywhere of the very common Roman practice of execution by crucifixion. Under the Romans, thieves and rebels as well as murderers were subjected to the humiliating, slow and painful death of crucifixion. We know nothing further regarding Yehohanan Ben Hagkol, including what his crime was. However, he has become renowned in his death in the modern era, because the nail which fixed his right heel to the wooden post of his cross, was bent. Once Yehohanan was dead, his family were at liberty to take his body down from the cross to bury it. Because the nail through his right heel could not be removed without causing further insult to his corpse, his family interred him with the nail and a bit of the wooden post, still in situ. For this reason, when his ossuary was opened almost 2000 years later, the researchers were amazed to find the iron nail still running through the heel bone. 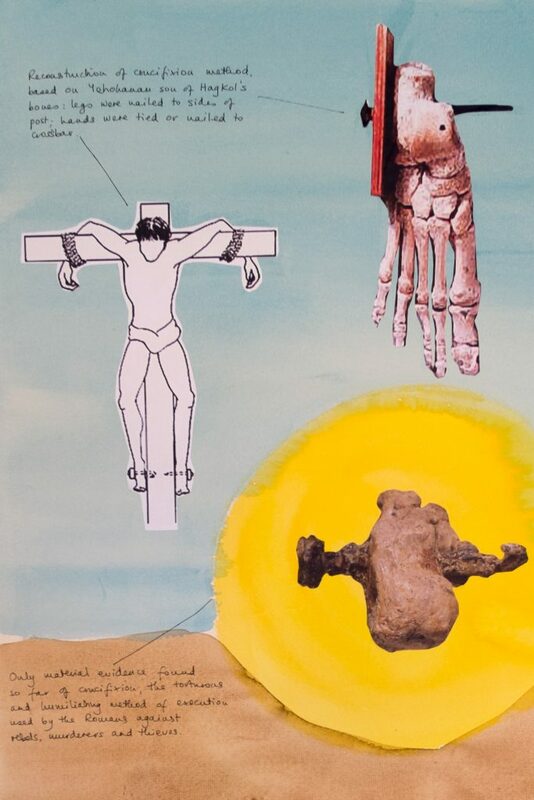 As a result of this discovery, scholars have reconsidered how the Romans actually crucified people and have now determined that at least some of the time, the foot of the person was nailed to the post through the heel and not through the front of the foot as is familiar to us from centuries of Western art. In hundreds of paintings, Jesus -and others- are shown on the cross, universally depicted with the two feet nailed to the cross from the front, either each foot separately, or with the feet crossed and a single nail passing through from the front of the foot. This assumption is also the basis of the Stigmata. In fact, Jesus the Jew, like Yehohanan the Jew, was most likely crucified by having his hands bound on a crossbar, and his heels nailed to the upright beam, as in my depiction. This is the subject and content of my art work. 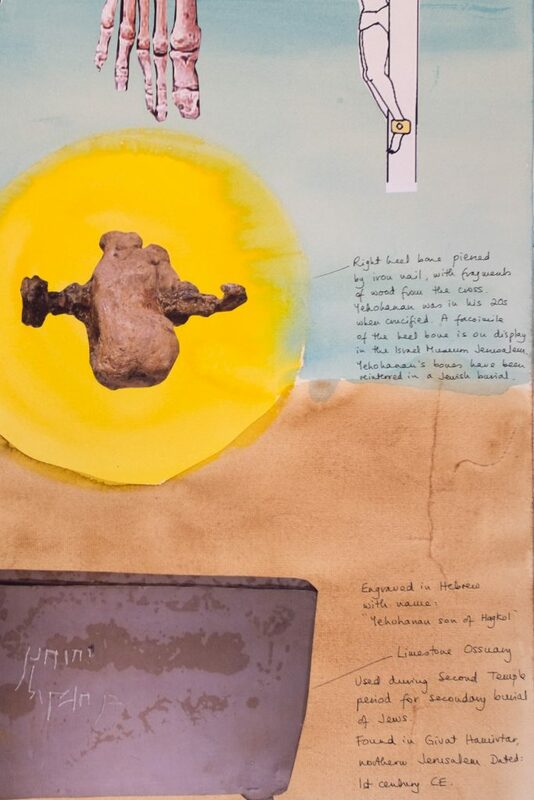 Yehohanan Ben Hagkol’s bones were reinterred in a Jewish burial and a facsimile of his right heel bone, with the nail running through it, is on permanent display in the Archaeology wing of the Israel Museum, Jerusalem.